(l-r) Angela Bassett attends the 70th Annual Primetime Emmy Awards on Sept. 17, 2018 in Los Angeles, California; Omarosa Manigault Newman attends the premiere of Briarcliff Entertainment’s ‘Fahrenheit 11/9' on Sept. 19, 2018 in Beverly Hills, California. Fun fact: The woman in the picture on the above left is not the controversial Omarosa Manigault Newman, but revered actress Angela Bassett. But you wouldn’t know that from several outlets that misidentified the Oscar-nominated actress after the Emmy Awards on Monday night. As reported by Yahoo News, which on Tuesday ran an article titled, in part, “Do all dark-skinned black women look the same?” it all started on Tuesday morning, when the New York Times ran a photo of the Marvelous Mrs. Maisel’s Rachel Brosnahan accepting her Emmy from presenters Tiffany Haddish and a woman they misidentified as “Omarosa Manigault Newman,” ignoring the obvious idiocy of Manigault Newman presenting a major acting award, despite her own well-documented history theatrics. And yet, “the Gray Lady” wasn’t the only one who committed the gaffe; in fact, it appeared the error began with Getty Images, where many media outlets (including this one) source their images (and captions for stories). The erroneous mention[s] appearing in the metadata of this photo by Robyn BECK has been modified in AFP systems in the following manner: [Angela Bassett] instead of [Omarosa Manigault Newman]. Please immediately remove the erroneous mention[s] from all your online services and delete it (them) from your servers. If you have been authorized by AFP to distribute it (them) to third parties, please ensure that the same actions are carried out by them. Failure to promptly comply with these instructions will entail liability on your part for any continued or post notification usage. Therefore we thank you very much for all your attention and prompt action. We are sorry for the inconvenience this notification may cause and remain at your disposal for any further information you may require. 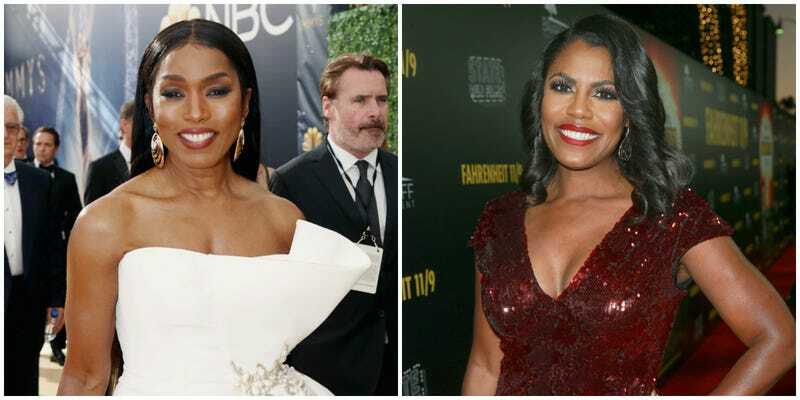 We have no idea how Bassett’s camp (or Manigault Newman’s) responded to what most considered a pretty egregious and offensive error, but it’s worth noting that Bassett and Manigault Newman were far from the only black women confused in post-Emmys coverage. A search of Insecure writer and co-star Natasha Rothwell simultaneously pulled up pictures of singer and fellow HBO Emmys afterparty Jill Scott, while a search for the absent This Is Us co-star Susan Kelechi Watson also resulted in photos of comedian Jessica Robin Moore (also known as @jesshilarious). And let’s not forget Fox News’ super dis-R-E-S-P-E-C-T-ful tribute to the recently deceased Aretha Franklin, which included a picture of her purported nemesis, Patti LaBelle. And to some extent, we get it; after all, people do resemble each other (not Aretha and Patti, though). In fact, The Root staff notes that redheaded actresses Amy Adams and Isla Fisher are particularly hard to tell apart—throw in a Bryce Dallas Howard or a redheaded Rachel McAdams, and we lose all discernment. However, outside of her skin tone, Angela Bassett in no way, shape or form represents former White House aide and eternal eyebrow-raiser Omarosa, leading us to believe that somebody—namely, the photographers Getty regularly employs—simply isn’t paying attention, since traditional practice is for the names of everyone who appears on a step-and-repeat to be shouted out for the paparazzi.